Widjiitiwin » Mary Did You Know? Thinking about Jesus’ momma tonight. 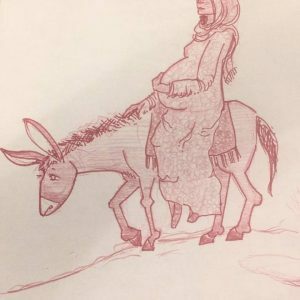 We celebrate four weeks of #advent these days, but she had roughly forty weeks to anticipate the Messiah’s birth — to fret over the growing infant, to think about their future family, to wonder how long she’d be permitted to keep him. I suspect there were many mingled emotions in Mary’s heart as she plodded towards Bethlehem with her husband: joy and burden; hope and concern; peace and fear. Ultimately, Jesus’s earthly life led him to the cross. Only because of that truth do we now have access to joy and hope and peace that conquers all burdens, concerns and fears.